“This fascinating little book is filled with well-researched and very well-written accounts of twenty-eight exceptionally nasty people…. Not all in this book are soaked in blood. 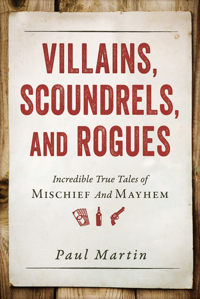 Some are thieves of epic proportions, others con-men, spies, hedonists, and some simply fools…. Author Paul Martin doesn’t know the meaning of the word boring.” Five Stars. “Martin delivers the reverse of his Secret Heroes, highlighting Americans who have negatively impacted society in a variety of stomach-churning ways…. They make a pretty reprehensible bunch, but Martin puts their crimes in context while keeping the book entertaining and informative.” Starred Review.